"Luxio" redirects here. For a minivan sold in Indonesia by Daihatsu, see Daihatsu Luxio. The fourth generation (Generation IV) of the Pokémon franchise features 107 fictional creatures introduced to the core video game series in the 2006 Nintendo DS games Pokémon Diamond and Pearl. Some Pokémon in this generation were introduced in animated adaptations of the franchise before Diamond and Pearl, such as number 438 Bonsly, number 439 Mime Jr., and number 446 Munchlax, which were recurring characters in the Pokémon anime series in 2005 and 2006. The following list displays the 107 Pokémon of Generation IV in order of their National Pokédex number. The first Pokémon, Turtwig, is number 387, and the last, Arceus, is number 493. Mega evolutions are included for convenience. Wormadam Minomadam 413 Bug Grass Does not evolve Diamond and Pearl "Plant Cloak Womadam"
Bug Ground "Sandy Cloak Wormadam"
Bug Steel "Trash Cloak Wormadam"
Cherrim Cherrim 421 Grass Does not evolve Diamond and Pearl Capable of changing between "Overcast" and "Sunshine" forms depending on in-battle weather effects. Bonsly Usohachi 438 Rock Sudowoodo (#185) XD: Gale of Darkness First appeared in XD: Gale of Darkness as part of a side quest, but was not obtainable. Spiritomb Mikaruge 442 Ghost Dark Does not evolve Diamond and Pearl It is said that 108 spirits formed this Pokemon. Lucario Lucario 448 Fighting Steel Mega Evolution Diamond and Pearl It can sense auras from a long distance. Porygon-Z Porygon-Z 474 Normal Does not evolve Diamond and Pearl While evolving it something went wrong and it began acting strange. Evolves by trading while holding a dubious disc. It has not appeared in the anime due to the "Electric Soldier Porygon" episode, which caused some viewers to have seizures in 1997. Froslass Yukimenoko 478 Ice Ghost Does not evolve Diamond and Pearl Design inspired by the Japanese yōkai Yuki-onna, a vengeful spirit that takes the form of a woman and traps its victims with its icy breath or within blizzards. Rotom Rotom 479 Electric Ghost Does not evolve Diamond and Pearl Rotom is capable of changing between six different forms by possessing various household appliances. It can also possess a special Pokédex used in Alola to assist trainers. Giratina Giratina 487 Ghost Dragon Does not evolve Diamond and Pearl Capable of changing between "Altered" and "Origin" formes. Controls antimatter. Phione Phione 489 Water Does not evolve Diamond and Pearl Can only be obtained by breeding Manaphy; however, Phione are incapable of evolving into Manaphy. Manaphy Manaphy 490 Water Does not evolve Diamond and Pearl Manaphy is a member of the sea guardians with Phione. Manaphy was the last Pokémon in the Sinnoh Pokédex before the Platinum expansion. Darkrai Darkrai 491 Dark Does not evolve Diamond and Pearl Darkrai was officially revealed in February 2007. It is a member of the Lunar duo together with Cresselia. Shaymin Shaymin 492 Grass Does not evolve Diamond and Pearl "Land Forme"
Grass Flying Platinum "Sky Forme"
Shaymin has a second form activated by using a Gracidea flower in the daytime. As opposed to its original Land Forme, Shaymin becomes the Grass/Flying-type Sky Forme. Shaymin's Sky Forme will revert into its Land Forme during the night, while frozen solid, or if it is deposited in the PC. Shaymin was officially revealed in February 2008, when it was listed as a star of Giratina and the Sky Warrior. In early June of the same year, its Sky Forme was revealed. Its Land Forme is based on a hedgehog while its Sky Forme is based on a deer and an angel. Arceus Arceus 493 Normal Does not evolve Diamond and Pearl Arceus changes its type when it is holding a specific item. Like Darkrai and Shaymin before it, Arceus was not officially revealed by Nintendo until February 14, 2009, the year of its debut movie. It was officially revealed to international audiences on August 3, 2009. Arceus is known as "The Original One", as it is said that it created Sinnoh and possibly created the entire Pokémon universe, along with the lake guardians and creation trio. It is the trio master of both the lake guardians and the creation trio. ^ Only female Burmy evolve into Womadam and their form is determined by the last location Burmy was used in battle. ^ Only male Burmy evolve into Mothim. ^ Prior to X and Y, Mime Jr. was a pure Psychic-type. ^ Prior to X and Y, Togekiss was a dual Normal- and Flying-type. ^ a b c d e f g h i j k l "キメわざポケモンキッズDP". Bandai Co., Ltd. (via WebCite). December 2008. Archived from the original on 28 July 2010. Retrieved 28 July 2010. ^ a b c d e f g h i j "キメわざポケモンキッズDP5". Bandai Co., Ltd. (via WebCite). May 2010. Archived from the original on 28 July 2010. Retrieved 28 July 2010. ^ a b c d e f g h i j "キメわざポケモンキッズDP3". Bandai Co., Ltd. (via WebCite). June 2009. Archived from the original on 28 July 2010. Retrieved 28 July 2010. ^ a b c d e f g h i j k l "キメわざポケモンキッズDP2". Bandai Co., Ltd. (via WebCite). March 2009. Archived from the original on 28 July 2010. Retrieved 28 July 2010. ^ a b c d e f g h i j k l m n o p q "Battle Dictionary" (PDF). The Pokémon Company International. Retrieved 1 February 2016. ^ a b c d e f "ポケモンメダルコレクション ダイヤモンド＆パール４". Bandai Co., Ltd. Retrieved 18 April 2011. ^ Vassar, Darryl (April 19, 2007). "The complete Pokemon Diamond and Pearl pokedex, part 3". GamesRadar. Future. Retrieved December 25, 2016. ^ Patricia Hernandez (August 18, 2014). "Nobody Expected This Pokémon To Win The Championship Last Weekend". Kotaku. Gawker Media. Retrieved October 11, 2015. ^ a b "キメわざポケモンキッズ5". Bandai Co., Ltd. (via WebCite). October 2006. Archived from the original on 28 July 2010. Retrieved 28 July 2010. ^ a b "ポケモンステッカー バトルピースコレクションＸＹ2". Takara Tomy Arts. Retrieved 1 January 2017. ^ "キメわざポケモンキッズ". Bandai Co., Ltd. (via WebCite). October 2005. Archived from the original on 28 July 2010. Retrieved 28 July 2010. ^ "キメわざポケモンキッズ6". Bandai Co., Ltd. (via WebCite). March 2007. Archived from the original on 28 July 2010. Retrieved 28 July 2010. ^ a b c d e "ポケメタルコレクションＸＹ メガエボリューション編". 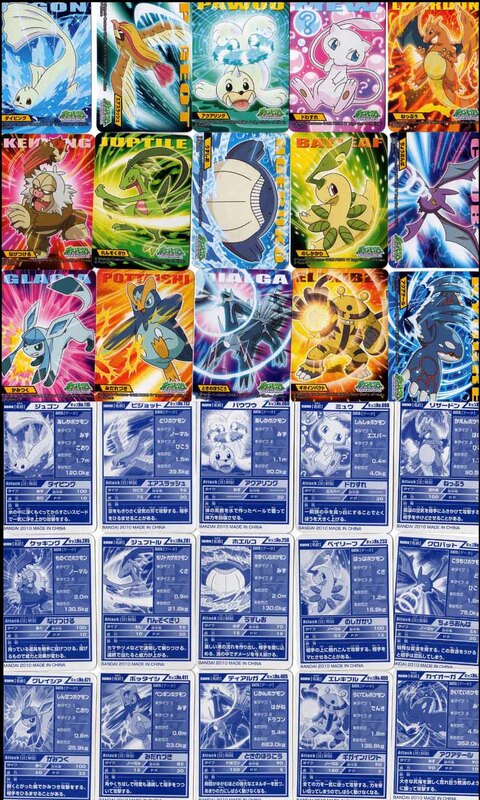 Takara Tomy Arts. Retrieved 1 January 2017. ^ "キメわざポケモンキッズ3". Bandai Co., Ltd. (via WebCite). April 2006. Archived from the original on 28 July 2010. Retrieved 28 July 2010. ^ Lucas Sullivan (February 8, 2014). "17 Pokemon based on real-world mythology". GamesRadar. Future plc. Retrieved January 27, 2016.